The waiting is over. Our new book "Business Model Generation: A Handbook for Visionaries, Game Changers, and Challengers" is now on the market. Yesterday we shipped over 1'000 pre-purchased books to more than 55 countries. 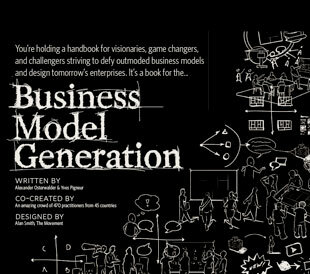 Enjoy the extensive online preview below and the FREE 72 page pdf preview of Business Model Generation. In order to keep the price affordable we are selling it over our book website for the first few months before distributing it through Amazon.com. We are curious to hear about your feedback regarding content and form. You may also want to have a closer look at the story and business model of the book, which are very special - more on that at the end of the preview. In this blogpost I explore the close relationship between business model and business plan. A business plan’s main role is to plan, outline and communicate a business (or not-for-profit) project and its implementation internally or externally. The motivation for the business plan may be to “sell” a project to potential investors or internally to top management and also serves as a planning document. In fact, when you have designed and thought through your business model you have the perfect basis for writing a good business plan. Structure your business plan into five main sections: The team, the business model, financial analysis, external environment, implementation roadmap, and risk analysis. One of the elements that particularly venture capitalists look at first is the management team of a project. Is the team experienced, knowledgeable and connected enough to pull-off what they propose? Highlight why your team is the right one to successfully build the business model you propose in the document. In this section you showcase the attractiveness of your business model. Use the Business Model Canvas to give an immediate overview of your model. Ideally you sketch it out with drawings. Then describe the value proposition, outline why you believe potential customers need it and explain how you are going to reach the market. Use stories. Then highlight the attractiveness of your target markets to get the reader of the business plan interested. Finally, outline what key resources and activities are required to build and operate the business model. This is traditionally an important part of the business plan that will attract a lot of attention. It contains the financial information that you can calculate based on your organization’s Business Model Canvas and a set of hypothesis of how many customers you can reach in a specific time period. This includes elements such as break-even analysis, sales scenarios and operating costs. The Canvas also helps you calculate capital spending and more generally how much it will cost you to implement the business model. Based on all these calculations you outline your funding requirements. In this section of the business plan you outline how your business model is positioned regarding the external environment. Outline market forces, industry forces, key trends, and macroeconomic situation. 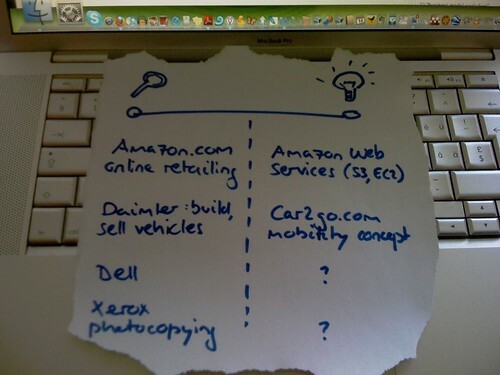 Summarizing, you need to stress what the competitive advantages of your business model are in this landscape. This section gives the reader an idea of what it takes to implement your business model and how you will do it. It includes a summery of all projects and the overall milestones. 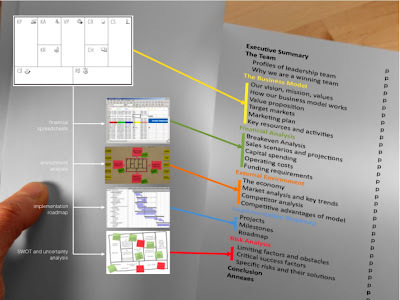 A project roadmap, including Gantt charts, then outlines the implementation agenda. The projects can be directly derived from your organization’s Canvas. At the end of the document you describe limiting factors and obstacles, as well as critical success factors. 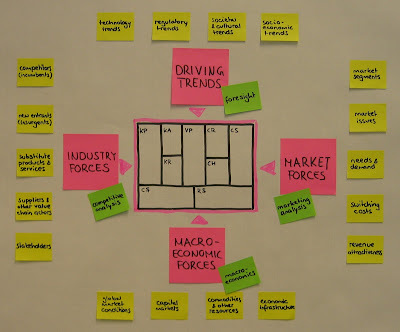 These can be easily derived from a SWOT analysis of your Business Model Canvas. This is a brief excerpt of the "outlook part" of my Business Model Generation book. Business models are designed and operated in a specific environment. Developing a good understanding of this environment helps you conceive better, more informed and likely more competitive business models. Scan your environment by mapping out four main areas. These are a) market forces, b) industry forces, c) driving trends, and c) macro-economic forces. Each can be divided into sub-areas that allow you to draw a picture of your business model's environment (see image below). Continuously scanning your business model’s environment is important because the economic landscape is driven by growing complexity (e.g. networked business models), increasing uncertainty (e.g. technology innovations) and market disruptions (e.g. new disruptive value propositions). Understanding the changes happening in this environment help you more rapidly adapt your model to shifting external forces. You should apprehend this environment as a sort of design space. It is a context in which you conceive or adapt your business model by taking into account a number of design drivers (e.g. new customer needs, new technologies, etc.) and design constraints (e.g. regulatory trends, dominant competitors, etc.). This environment should in no way limit your creativity or define your business model upfront. However, it should influence your design choices and help you make more informed decisions. I have two public workshops coming up, besides my work for companies and conferences. It would be a pleasure to meet you there! There is an attractive "early bird rate" until December 19. Also, in April I will do another North America tour. Toronto and New York are sure stops. Others will be defined in the coming weeks. If you want to be successful at innovation in companies today you have to involve everybody! That is one of the strongest quotes that I take away from Sir Ken Robinson's keynote that I attended in Toronto today. Michael Dila of Torch Partnership invited me to this event and I'm glad I accepted. Sir Ken is an authority in the field of creativity and innovation. In his talks he shows how we are taught to become uncreative throughout our educational systems. We have practically lost our ability to be creative by the time we arrive as so-called "knowledge workers" in companies ... In essence, this means that we don't have a creativity crisis in companies, but a structural crisis. Our educational system and our companies lack the structures it takes to make creativity flourish throughout our organizations. "saying that not all people can be creative is like saying that not all people can be literate"
I could not agree more. That is also one of the reasons I think we have such difficulties to achieve business model innovation. We believe only the "creatives" can come up with new and maybe disruptive ideas. However, inventing innovative business models requires co-creation and diverse teams from all hierarchical levels, divisions, age and gender groups. Everybody's creativity within an organization should contribute to strengthening and renewing the business model! Are you interested? Is this a worthwhile idea? What functionalists would you want from such a platform for a community of business model innovation practitioners? 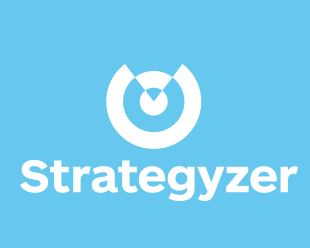 What business model innovation tools would be useful? Are there open source platforms out there that could be easily used for such a platform (non-branded, so the platform could have its own brand...)? Where can I get my platform developed through crowd-sourcing? Where can I get a good and cheap design crowd-sourced? By the way, there is one particular reason why I am so supercharged: 4 years ago I used to sit at the Wawee Coffee Shop in Chiang Mai, Thailand. 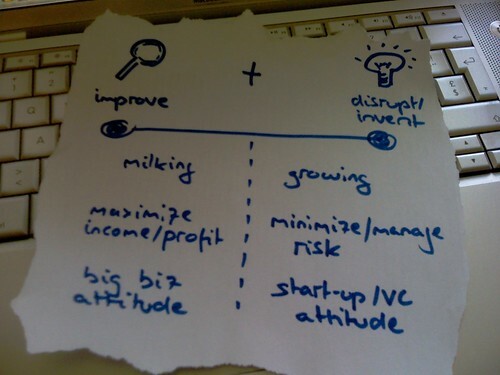 That is where I relaunched my blog on business model innovation. Since then I have never looked back. Many people know my blog and use my canvas. I am now invited for keynotes and workshops around the world. 4 years later I am sitting in a coffee shop in Brooklyn, New York, surrounded by entrepreneurs and students working on their Mac. I feel like this is the next stage for my work after those days in Chiang Mai. It's the launch of another stage: Together with Professor Yves Pigneur we want to lauch a new type of business book in 2009 on business model innovation. In addition to that I would love to connect the business model innovation community on a platform. There is just so much exciting innovation around business models going on at the moment... We need to bring that experience together! What will be different about this book that Professor Yves Pigneur and I are writing in collaboration with ULURU is the business model. We are launching this book based on an innovative business model, which is quite different from any other management book published to date. However, before revealing any ideas that we have come up with during our brainstorming sessions, I would like to get some inputs from you. Please help us design a great book by telling us what you would expect from a book by us on the topic of business model innovation. What will make you buy it? An important element of this book project will be that you can buy the book in advance, during the writing process to benefit from special features & services (e.g. video-interviews, web seminars, draft book chapters). If you are among the advance buyers you can influence the book content and will be mentioned as contributor. Two people who are at the forefront of thinking on the intersection between business and design will be speaking in Europe this November. Though this is not 100% related to business model design, I believe they promote the kind of tools & techniques that are necessary to come up with sound business models. I very much value their contributions of bringing design thinking to business. Victor and Jess will be first speaking at the IA Konferenz 2007 in Stuttgart, Germany (9./10. November). Jess will also speak at the Italian IA Summit 2007 in Trento, Italy (16./17. November). Laurent Haug: Laurent is a frequent guest at arvetica (the consulting boutique I work for). He's the founder of the top-notch social technology conference LIFT and the best connected man in Suisse Romande. A great source on new web tools - speak Web n.0. Nicolas Nova: Nicolas just passed by at our offices today to chat and to work on the final touces of his PhD dissertation. He's the best input you can imagine on the value of the latest technologies - particularly in the field of group collaboration. Nicolas is also part of the founding team of LIFT. 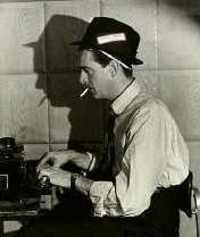 Irving Wladawsky-Berger: Vice President, Technical Strategy and Innovation at IBM Corporation. Though he probably doesn't know me, I know his blog ;-) It's a great source to understand where IBM is heading - interesting material. I'd love to have a chat with him. Pascal Rossini: Pascal is one of the top Web (2.0) entrepreneurs of Switzerland and I had the great pleasure to do some consulting work for him. His newest coup is ADS-click, Sky-click and Skippi. Follow his ventures. Ralf Beuker: Ralf is at the forefront of design management. When we met last December we had some great discussions on design thinking. A true source of inspiration. It's quite funny that I tried to convince a number of other friends to start blogging last year ('06)... Actually the motivation was a bit egoistic: It's the most convenient way for me to follow their latest innovative thinking. Some have actually followed my advice, like Gerry Schnyder who is currently in London working on his PhD about comparative corporate governance. Why has the business model concept and business model innovation become so important: I believe business executives have much more choice than 10-15 years ago in designing their business model. Each business model building block allows for a wide range of choices. An executive can design various distribution channel strategies, he can opt for many different types of customer relationships, he can build many diverse revenue streams, he can enrich physical products with information services and, and, and. Much of this was more limited just some years ago. Wich people should join the group leading a firm's effort on business model innovation: In my opinion the selection should be as a large as possible. The people should definitely come from different areas of a company. The business model concept is an overarching construction and can help overcome the still dominant silo-thinking that has many companies in its grip. In order for innovative business model building blocks to become reinforcing people must work together from various company backgrounds. The different evolution of technological disruption and business model disruptions: I pointed Clint to an article from Constantinos Markides which compares the former to the latter (ref: Disruptive Innovation: In Need of Better Theory). While I don't think the article is very good, it does make one particularly interesting observation: Disruptive technologies tend to replace incumbent technologies, whereas disruptive business models tend to co-exist with incumbent business models. Examples are numerous: airline industry, computer sales, etc. This leads to another interesting point: Various economic areas are increasingly characterised by multiple (innovative) business models. A last thing I believe is terribly important to understand, but which we haven't discussed in the interview, is the difficulty to classify certain business models among an industry sector. 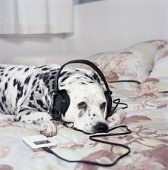 In which industry would you say does Apple's iPod/iTunes initiative operate? Should we classify Apple's business model in the hardware industry, software industry, music industry or even design industry? What is disturbing is not so much the fact that we can't classify their business model, but that analysts and consultants still largely use methods referring to "industry", while the concept is becoming outdated... Michael Porter's five forces model is such an example. I predict that in the future we will see more and more business models that will be impossible to be classified in specific industries. This means that methods of industry analysis will be of less and less value. Today's FT ran an interesting article about Alfa Romeo, the Italian carmaker. The story makes a nice showcase for outlining how important it is to align the different building blocks of one's business model. This is clearly a case of unaligned business model building blocks... In my language of describing business models this means that "distribution channel" and "customer relation" are not aligned with the "value proposition" and the "target customers" (as outlined in the slides below). The open question is if Alfa's managers were unable to understand this or if they were simply sluggish in the execution. However, today the company is serious about its strategy execution. As the FT outlines, this reorientation is part of a broader turnaround at Fiat, the Italian industrial group that owns Alfa. The initiative has been led by Sergio Marchionne, Fiat's CEO since '04 (by the way, Marchionne is very well known to Swiss business as a turn-around manager...). Alfa is now taking care about its distribution channel design and is, for instance, reviewing all its UK car dealers to assure a high-end distribution style. They've hired SGS, a Swiss auditing company (formerly turned-around by Marchionne) to improve compliance with the required quality and in case necessary replace existing car dealers with new ones. While moving homes has dark sides it also has bright sides: In a huge pile of unread and half-read magazines (who doesn't know that phenomena ;-) I stumbled across the September issue of Wired. The cover story was about the "rebirth of music" and triggered a lot of ideas in my mind. First of all, I realized at what point the music industry is currently a huge business model design laboratory. It's not new that old and new business models are clashing in this domain, but the richness of all these new business models is astonishing. I believe it might be the industry with the most different types of business models competing against each other these days. Sedondly, while reading I understood that other industries MUST follow the evolution of business models in the music industry if they want to be prepared for business model innovation in their own industry. I'm not only talking about intellectual property rights (IPRs), peer-to-peer (P2P) music sharing platforms and lessons for the film industry. I'm talking about genuine insights into business model innovation. Finally, The music industry transformation is giving us lessons about business model innovation in many different building blocks, such as distribution channels (mobile phones, P2P, USB-sticks, TV series, MySpace, game consoles, ...), service & product innovation (free remixing platforms, ringtones, communities of interest, recommendation engines & music DNA...), revenue streams (various forms of advertising, live-streamed concerts, ...) and so on. One of my favorite business model innovations picked from the several Wired stories is the one where movie theaters offer live streaming of sold-out concerts on their big screens (Big-Screen Bands). With help from National CineMedia, your local cineplex can show live footage from a sold-out concert in New York City. Sure, you may not get away with smoking a joint and sipping a flask, but for $15, you’ll get comfy stadium seating and a view of every wrinkle on the aging rocker’s face. WOW - this simple innovation involves new value added services, new distribution channels, reducing fixed costs, partnerships and new revenue streams. My advice: go out and learn about the business model innovations taking place in the laboratory of the music industry today - then apply the lessons to your own field. I found reading this short interview on business model innovation with Clayton Christensen, the renowned Harvard professor and author, quite worthwhile. He offers some trenchant advice on business model innovation. Even more important: It shows how hot the topic currently is. I saw Christensen speak at a conference a few years ago and he certainly isn't a person who jumps on a topic just because of the buzz. Yes. Most new products and technologies can be sold through the existing business models. In fact, the corporation will reject process or resource allocations that don't fit its business model. A powerful reason why companies aren’t good at business-model innovation is because the kind of products that are required to be the seed of a new model can’t get through the resource allocation process.